117 pages, 8.5” x 11”, black & white, 3-ring binder; 29 chapters. Pricing – a worksheet; Goals – self-evaluation; Donations; actual samples of gallery contracts; How to give an artist’s talk; and 20 ways to make your artwork appreciate in value. 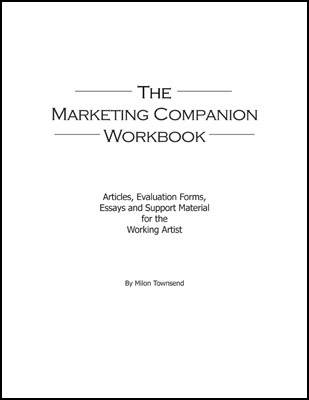 This book is specifically designed to supplement ‘Making & Marketing Better Artwork’, not duplicate it. This book contains worksheets and evaluations to assist you in identifying your areas of strength as well as those where you’ll do best to obtain assistance. Thoughts about making Art as well as developing your artistic vocabulary, voice and vision round this book out, allowing you to grow your internal nature as well as your external, practical self.